Successfully Added Bluetooth MP3 Player Sunglasses - 2GB Flash Memory to your Shopping Cart. 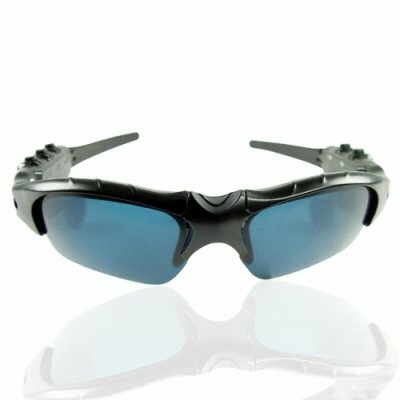 Bluetooth MP3 Player Sunglasses - 2GB Flash Memory. Gadget sunglasses / shades with an 2GB MP3 Player and wireless Bluetooth headset built-in. Built discreetly into the cool looking lightweight sunglasses frames are, on one side, an MP3 and WMA player, and on the other side a Bluetooth headset which can be paired with a mobile phone to enable to you listen and speak. These music / communication mp3 shades feature fully adjustable earphones attached to the glasses frames, a built in MIC for speaking, and easy control for both the MP3 player and the Bluetooth headset. Take your music with you in the coolest way possible, and leave the mobile phone in your pocket where it belongs with this smart music and communication device. Available for single piece sample orders or bulk stock orders - get yours today! I liked the look of these so bought a pair for holiday, i was so impressed with the quality and sound of them when running, biking and skiing I have ordered more at the highter discount as Chrissie presents. Ordered on the Tuesday and delivered on the Friday , talk about good service. I bought this glass reaches 16 days after i order, it was working fine, Mp3 is Good and sound excellent and bluetooth pairing wow, Now my driving is comfortable and securable with phone calls. thanks chinavasion or the wonderful product. I hope i could make some more purchase of this product soon for my friends too.